There are various car jacks available to lift your vehicle from the ground but the floor jack is the safest and most stable. They come in various forms that include heavy duty examples with large weight capacities to low profile floor jacks for low cars. The best floor jack is the Arcan XL2T Low Profile Jack that be able to fit underneath low cars and lift to a maximum of 24 inches with a 2 tonne gross weight capacity. Many cars will have a bottle of scissor car jack in the trunk but these should only be used in an emergency situation. If you are planning on doing extensive work underneath your car, it would be advised to use a floor jack and jack stands. When working underneath a vehicle, safety is crucial and using an unstable car jack may result in injury if it were to collapse. Considering that the latest generation of floor jacks have dropped in price, it would be silly not to invest in a new one. Many people will make the mistake of paying much more for a jack because the weight capacity isn’t as much as their car. Its important to remember that you will not be lifting the whole weight of the car with the service jack but just one axle weight. Whether you will be lifting a regular car, truck or lowered car, there is a wide variety of options available. Below is a list of the best floor jacks that will safely lift the car from the ground and lock in place. This Arcan XL2T has been designed to be a floor jack for low cars that are either on coilovers, chopped springs or is a low down super car. Many cars these days are lowered and can barely get over speed bumps in the road and things get worse when trying to put a standard jack underneath. Compared to the alternatives, this floor jack looks much more attractive in the sleek black. It offers great clearance, lift height, durability and is very easy to use. The only drawback would be that it is fairly heavy but this is to be expected. Overall the Arcan XL2T is the best low profile floor jack that will fit under the majority of low cars. The additional length means it can reach to multiple areas underneath your car in case you are unable to get to the jacking points. The Performance Tool W1627 is a premium floor jack with various sizes that include 1 1/2 tonne to 3 1/2 tonne. They also offer the Performance Tool W1627 as a standard trolley jack, heavy duty and low profile form too. This floor jack is made from a high quality steel frame with the added bonus of an over load protection by pass valve that is an added safety feature. The extra long steel frame is designed for the best stability coupled with a low profile that allows you to get under those low down vehicles. It has a rubber saddle pad that will reduce the damage to the car bodywork if you accidentally hit it too. Overall, it is the best floor jack you can buy with various different forms to choose from depending upon your budget. The Arcan XL2T is the preferred option in terms of low profile floor jacks but this jack has a variety of other high quality options available. The Powerzone floor jack is highly rated across mechanics and the average car owners. The quality of the materials used and functionality are reason that make it one of the best floor jacks. It is just about on the limit to be under the category of “low profile” but it will certainly fit under the majority of cars. It has been designed by a company that know exactly what they are doing. For example, the steel handle has a molded grip with a foam bumper to prevent damage to the vehicle. Its fairly easy to let the handle go all the way and hit the bodywork, which makes the foam a very good idea. Overall the Liftmaster 3 ton floor jack is strong and has excellent build quality for a great all rounder. It is reasonably priced and the shiny steel finish is uniquely designed to fit in nicely with most garages. The unconventional design of this floor jack may become difficult to maneuver with a single wheel at the front. It is also the heaviest out of all the trolley jacks however, this is as expected. Overall it is a cheap floor jack that can be used with low cars and comes with various lifting capacities. Almost every car will have some sort of car jack, which is usually located within the trunk. They will either be an angled, scissor or bottle jack and are great for emergencies such as a tire blowout. However, for those that want to lift their car with extra stability and safety, a top rated floor jack is required. Simply locate the jacking point, place the trolley jack underneath and you can lift the car straight up. 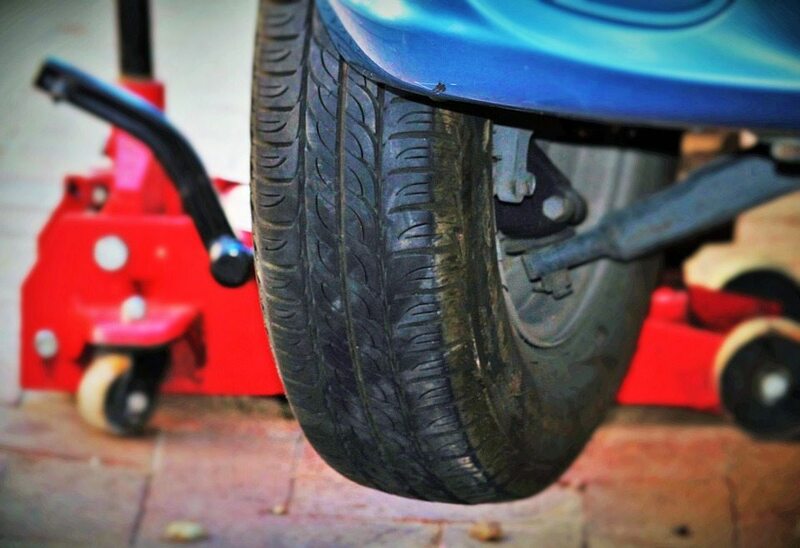 We strongly recommend that you purchase some jack stands too if you intend on being underneath the car for long periods for additional safety. Below is a buying guide to help you make the correct decision when purchasing a floor jack. The terms low profile floor jack refers to a service jack that has a lower entry position than the traditional jack would have. The entry height is usually between the range of 2 to 4 inches with the shorter height being more desirable. The purpose is simple, if you have a sports car or lowered car, you will not be able to fit the jack underneath without damaging the sill or sideskirt. Floor jacks for lowered cars is a must with many floor jacks being offered with a lower profile. The only drawback is that they are slightly more expensive but knowing that it will fit under your car is a small price to pay. Many people will misjudge the weight capacity of the trolley jack for the total weight of the car. Using a trolley jack, you will only really lift 1 axle in the air and this will not weigh the same as the gross weight of the car. The most popular car jacks are a 2 ton and 3 ton floor jack as this is surplus requirements for both cars and trucks. If you have a vehicle larger than these weight capacities, you may require a specialist heavy duty floor jack, which there are many. The ability to raise the car that little bit further is always a benefit. Over 20 inches is above average and will certainly assist many common service jobs. For example, lifting the engine to replace worn engine mounts by using the jack. The Arcan low profile floor jack has the largest lift at 24 inches, which is further testament to how good this floor jack really is. When it comes to safety, you should never purchase something that could break fairly easily. You should want to buy a heavy duty floor jack that can withstand years of excessive usage and is built to last. Most steel and aluminum floor jack constructions are the best for build quality and long lasting performance. Even on a small budget, you are able to find high build quality car jacks. The purpose of the floor jack is to lift your car and if its struggling to hold your car whilst your underneath it, you could seriously injure yourself. As mentioned above, ensuring the weight capacity of the jack is able to lift is very important but there are other factors. For example, a wider saddle with a lip will be able to help you locate the safest jacking point location. Many brands will also add further safety features and these are all beneficial for those working underneath cars for long periods. Although it doesn’t need frequent maintenance, a floor jack will require attention from time to time. We recommend that you check for any leaks and cracks around the casting because this can be a sign that it may give way at some point and that you need a new floor jack. When the floor jack is not in use, we highly recommend that the pump and piston is retracted. This will put less stress of the jack and reduce the chances of leaks. The saddle of the floor jack uses the jacking point to safely lift the vehicle from the ground. Sometimes this can cause issues with low cars as the jack is unable to get underneath it. As shown in the below image, the jacking point is a rubber pad that is located on each axle (should be at least 4 on standard cars). 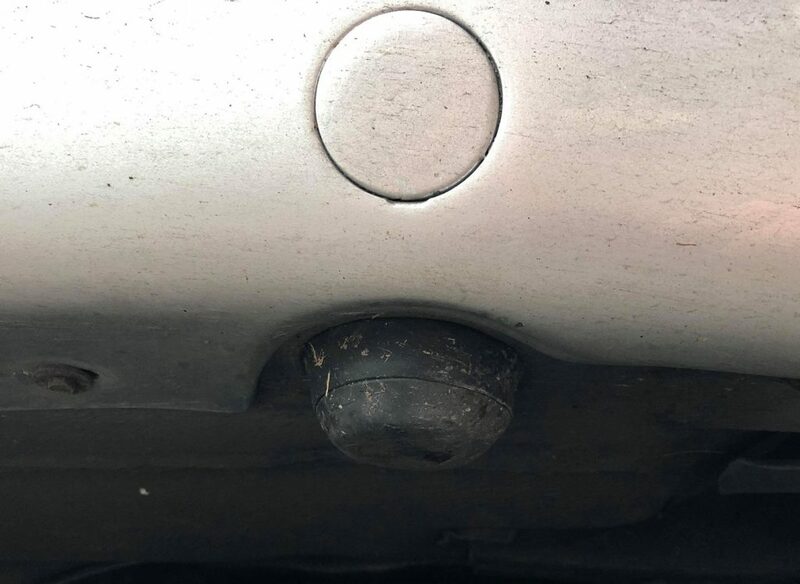 Older cars can sometimes see these rubber jacking points broken or worn away and if this is the case, you need to look for an alternative solution for lifting your vehicle. This may be a problem too if you intend to use a garage car lift to lift the car from the ground too. You can opt to lift the car from the chassis or a solid part of the undercarriage. Do not make the mistake of placing it on something that is not solid because the pressure will cause it to bend. An often overlooked feature when searching for the best floor jack is the weight and mobility when transporting the jack. When it comes to the weight, they are always going to be fairly heavy but useful handles on either side of the jack make it easier to transport. For example, lifting it in and out of your trunk when required to do so. Mobility of a floor jack can be improved by the pivoting wheels and if they fail, you will find it fairly hard work pulling it around wherever you go. Investing into a quality floor jack is highly advised and if you are frequently underneath a car, investing into other tools such as stands or even car ramps will further improve your safety. All of our recommendations listed within this article offer various different types from a 3 ton floor jack to low profile constructions for low cars.